There is no wood in these chairs, but they are sturdy and can last up to two decades. 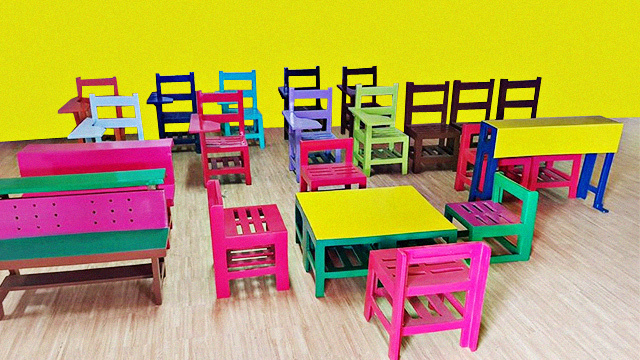 At first glance, these brightly colored school chairs look like they’re made of wood, but they're actually from recycled plastic waste. This is the brainchild of a mechanical engineer named Winchester Lemen, who runs Envirotech Waste Recycling in Davao City. After installing a recycling plant in Davao City, Envirotech started collecting plastic waste from a nearby landfill. It eventually reached out to help a neighboring barangay that had a plastic problem piling up in the landfill. Winchester Lemen, the founder of Winder Recycling Company, shows a potential French client their recycling plant where plastic waste is segregated as part of their process. It was around this time that the idea of making school chairs came to Lemen. In an interview with SmartParenting.com.ph via Facebook Messenger, Lemen shared that an acquaintance visited the recycling plant in Davao and asked if it would be possible to create something helpful to students using recycled plastic. It just so happened that Lemen already had a prototype of a school chair made from plastic waste. The visitor excitedly ordered 200 chairs to be shipped to Manila. “Little did I know that he showed the chairs to Quezon City Mayor Herbert Bautista. After that, they created a ‘Green Fund’ for this particular project,” Lemen shares. The Green Fund is part of Quezon City’s initiatives, which includes various environmental projects that establishments operating in the city can support. One of Lemen's first clients was a councilor who donated the school chairs in various public schools in his Quezon City district. 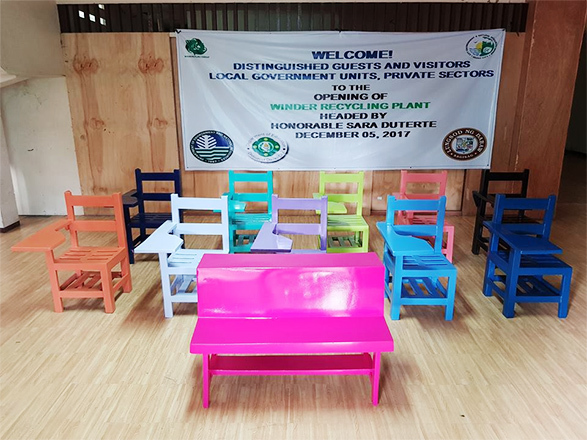 Then, companies like Robinsons Supermarket and SM bought chairs to give to schools that belong to their corporate social responsibility campaigns. Soon, local government units would either tap Lemen to set up a recycling center in communities or help out in delivering plastic waste to the recycling plant to be converted into chairs. The school chairs come in different designs for various age and grade levels, including low tables and chairs and armchairs. 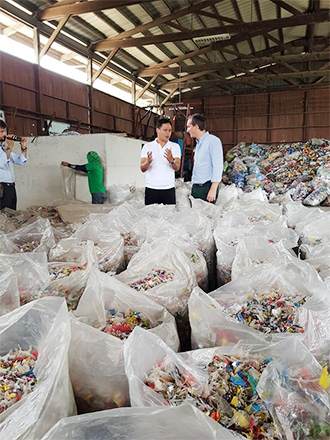 In 2017, Lemen and Derrick Tan, an entrepreneur who is also an environmentalist, decided to become partners and founded Winder Recycling Company, a Davao-based business that wants to do its share of reducing the plastic waste in the country. “This is a partnership that helps create jobs, helps with reforestation and solves the problem of plastic waste,” Lemen tells Smart Parenting. With their new company, they are able to manufacture more chairs and attract more clients. They also gained more recognition as visitors from other countries like India, France, and Kenya came to their plant to know more about their products. 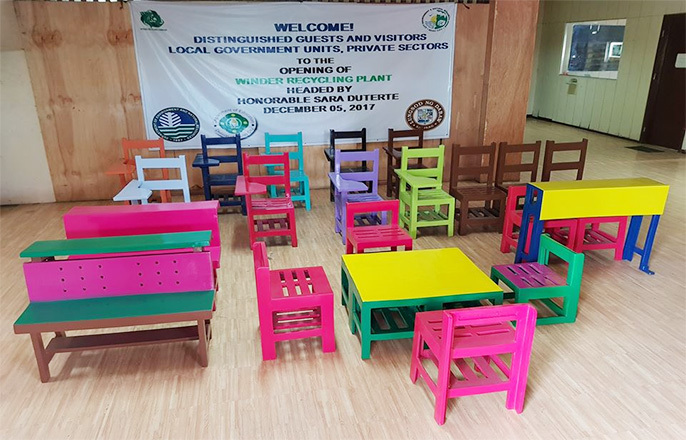 The school chairs are made from all kinds of plastic waste like sando bags, candy wrappers, junk-food packaging, plastic straws, sachets, laminated plastics with foil, sacks, and plastic bottles of any shape. These are then shredded and properly cleaned to eliminate the dirt and oil. After shredding, the plastic waste is melted and molded to form a school chair. Then it is assembled, sanded, and painted. The chairs are assembled with interlocking parts, which means there’s no need to use nails or adhesive to hold the chair together. It’s also easy to assemble. The best part: “We are saving a three-year-old tree, which is used to manufacture school chairs, for every plastic chair that we make using recycled plastic waste,” Lemen says. Winder Recycling Company accepts orders for their furniture. Contact them through their Facebook page or at 0917-678-9889. Should you wish to donate plastic waste, you may send it straight to their plant at Winder Recycling Plant, Kilometer 11, Sasa, Davao City. 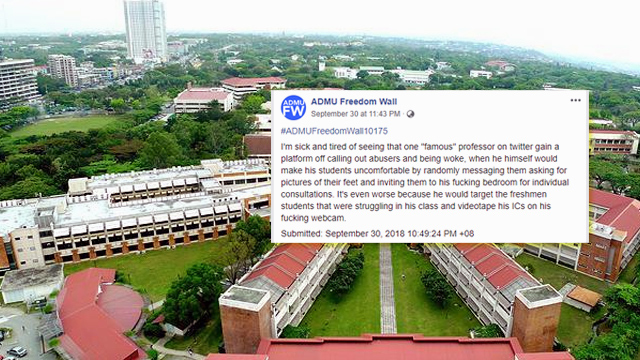 This story originally appeared on Smartparenting.com.ph and was updated on October 4, 2018 at 12:46 p.m. Minor edits have been made by the Spot.ph editors.